It is that time of year when there are picnics, concerts in the park, beach days and the Hollywood Bowl. 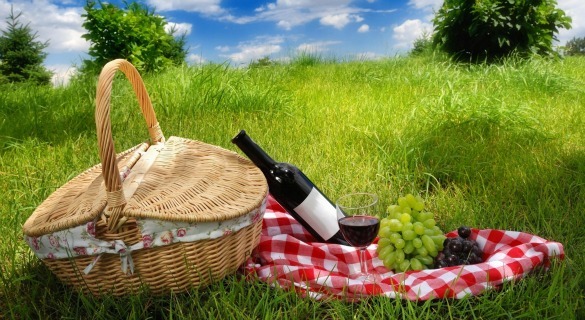 Picnics can be as simple as a peanut butter and jelly sandwich with fresh fruit and chips — or, if you hang with a bunch of foodies they can be as elaborate as any indoor-at-home meal. Most of us have some sort of cooling/packing equipment so it makes for a easy “get up and go.” (Trader Joe’s has a fantastic insulated blue bag that is back in stock for the summer.) As goofy as Deviled Eggs seem they are always the first to go so I usually make a couple variations. The grilled asparagus is simple. Add fig spread to make it special. You can also steam the asparagus, but I love the texture of grilling. I admit that I love fried chicken — it is the most perfect staple picnic food. I have cooked with the best of the best and some of the most passionate debates I have ever witnessed are over fried chicken. To egg or not to egg. To buttermilk or not to buttermilk. This recipe is quick and simple. While people are constantly requesting my version, I call it a work in progress and will happily be challenged by anyone to find the best! Throw in a few appetizers, a few wraps, and end with decadent chocolate cupcakes great for kids as well as the adults. As far as beverages some venues and parks allow wine while others do not. I usually purchase two big gallon water jugs. In one I simply add lemon, lime and cucumber to make spa water, and in the other I add a can of frozen lemonade and two Celestial Seasonings cold brew tea bags, such as Tropical Fruit and Raspberry. Enjoy these recipes no matter where you go! Peel eggs and very carefully slice eggs in half the long way, keeping the whites intact as much as possible. Place whites on tray, holes up. Drop yolks into a small mixing bowl and smash with a fork. Add remaining ingredients and mix with fork until smooth. You can fill the egg whites by using a small spoon or a pastry bag. Sprinkle with paprika or chopped chives for a little color, and serve or refrigerate. Serves 6. In a medium-size bowl, mash the egg yolks with a fork. Add the bacon, shallot, mayonnaise, mustard, vinegar, salt, pepper and Tabasco. If desired, fill a pastry bag fitted with a large star tip and pipe the yolk mixture back into the egg whites. Or use a small spoon to fill the whites. Sprinkle with paprika and serve. Serves 6. Trim asparagus and cut to about 4 inch spears. On a medium grill or stovetop grill, place asparagus and cook turning often about 10 minutes. Lay out a piece of proscuitto, cut in half. Spread with goat cheese and carefully place the asparagus spear at the left end and roll to the right. Repeat until all asparagus is wrapped. This is so simple and looks so pretty. Most of the time they come in containers with an assortment of red, yellow and orange. Using small knife stuff each half with about a teaspoon of cheese. Sprinkle chives over the top as a garnish. In a large bowl gently toss all ingredients together. In a food processor finely chop the garlic. Add the rest of the ingredients and puree until smooth, stopping the machine twice to scrape down the sides of the bowl. Transfer to a serving bowl and serve at room temperature with veggies and pita bread. Combine the first 6 ingredients in a medium bowl. Cover and chill 2 hours. Arrange 2 slices of prosciutto and 6 asparagus spears on each lavosh. Spoon about 1/3 cup cheese mixture over the asparagus. Season with salt and pepper and roll up. Slice in half on the diagonal. Makes 12 halves and serves 8-10. Preheat the oven to 350. Line 12 muffin cups with liners. Melt the chocolate in a double boiler over boiling water. Remove the pan from the heat. Whisk the sugar, flour, baking soda, and salt together into a large bowl. In a medium bowl, whisk together the hot coffee, sour cream, and butter. Gradually whisk in the eggs, and then stir in the chocolate. Add the wet ingredients to the dry ingredients and stir until all the ingredients are smoothly blended. Fill the cupcake liners about two-thirds full. Bake until a toothpick inserted in the center of a cupcake comes out clean, 20 to 25 minutes. Cool completely on a wire rack. Makes 12, but can be easily doubled. Melt the chocolate in a double boiler over boiling water. Place the milk, sugar, and salt in a medium bowl and stir until the sugar is dissolved, about 2 minutes. Add the chocolate in a slow stream and mix until thoroughly blended. Makes three cups. Cream the butter until smooth then add the egg yolks one at a time, beating after each addition. Add the salt and vanilla and a little of the sugar and beat until smooth. Gradually beat in additional sugar until butter cream is a desired consistency. Add milk to thin and chill to thicken. Makes 2 cups.